Courier industry products and services specially selected to help build, maintain, and manage your courier business and vehicles. Here at Sky Insurance we offer a professional and friendly service. We specialise in courier, hire & reward, multi drop insurance and work with some of the UK's largest courier companies. Our aim is to find you the perfect insurance policy at an attractive price. Our experienced staff are on hand to listen to what you need. We have access to the UK’s leading insurance companies who specialise in hire and reward, courier and haulage insurance. Call us today to discuss your requirements with our specialists and obtain a competitive quote from our panel of insurers. 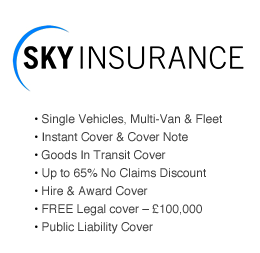 Call now on 0800 038 7412 or 01707 642552 for a quote or for more information visit skyinsurance.co.uk. Get a great deal on your courier and GIT insurance by comparing insurers through specialist insurance brokers, Bollington. With a dedicated courier team and exclusive rates available, Bollington can search the market for you and find the best deal from their panel of insurers. Save money by combining your courier and GIT with our exclusive package. We can also offer policies with protected no claims, FREE European cover for up to 90 days, no windscreen excess and low excesses. Open Monday-Friday 8.30am-8pm and Saturday 9am-1pm. Call us for our best rates on 01625 348 189! Are you trying to deliver your message direct to your target audience? If you offer a great product or service that we can recommend to our members, we can provide a powerful solution to put your brand in front of the people that you want to speak to. Contact us directly to discuss advertising and sponsorship opportunities. We help our advertisers and sponsors reach the businesses they need to, when they need to. We offer a range of options across various different media to expose your product or service to businesses actively involved in freight and logistics. Contact us directly to find out more about advertising opportunities. Powered by mtvan.com - Exchange Software V3.1. Generated in 0.0076 seconds.